Sophie Blanchard was a provincial lady with a nervous disposition. Ordinary carriage trips frightened her. Yet she was to go on to become the most famous balloonist of the Napoleonic age and the first female professional balloonist in the world. Sophie couldn’t claim the title of the first woman balloonist. On May 20, 1784, four society ladies had taken a trip on a tethered balloon in Paris. Sophie also wasn’t the first women to ascend in an untethered balloon. Citoyenne Henri had that honour in 1798. However, Sophie was the first woman to pilot her own balloon and the first to make ballooning her career. Sophie married Jean Pierre Blanchard, the first professional balloonist in the world, and the couple travelled round Europe giving demonstrations of balloon flying. 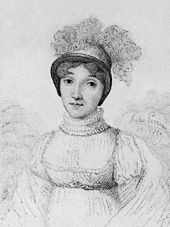 Although Sophie only began to fly in 1804 in an attempt to draw greater audiences and salvage their business which, through poor business acumen, Jean Pierre had brought close to bankruptcy. They hoped the novelty of a female balloonist would untangle their finances and so it proved. In 1809, Jean Pierre Blanchard died after he fell from his balloon in the Hague following a heart attack. 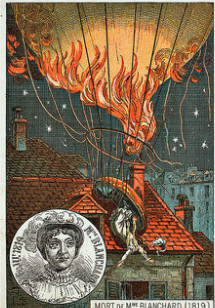 Thereafter, Sophie continued to ascend alone and began to specialise in night flights combining firework displays with her flights with the fireworks launched from her balloon to add to the spectacle. Napoleon championed Sophie and designated her the “Aeronaut of the Official Festivals,” making her responsible for organizing ballooning displays at festivals and other events. Sophie’s fame spread throughout Europe and she attracted large crowds to watch her ascents. She even crossed the Alps by balloon, a trip in which icicles formed on her hands and face. On 6th July 1819 she performed her final flight above the Tivoli Gardens in Paris. In particularly windy conditions her fireworks ignited her balloon and it fell from the sky. Hitting the roof of a house in the Rue de Provence Sophie was pitched out of the gondola and fell to her death. She thus achieved her final “first”, being the first female fatality in an aeronautical accident.